Michele McCormick outside the pipe that vents sewer gases from her home in Laguna Terrace Park. Water district workers this week installed odor-trapping backflow devices at the connections of its sewer main with Laguna Terrace Park, the Laguna Beach mobile home park where a growing group of residents say sewer odors and hydrogen sulfide gases infiltrate their mobile homes and make some sick. Since three residents publicly aired their predicament last week and appealed to the City Council for help, more residents – now 22 — have come forward to report similar experiences, said Michele McCormick, a five-year park resident, who has reported offensive smells infusing her home dozens of times over the past 17 months to park management and state officials. Only in recent weeks has the park’s owner, Chicago-based Hometown America, agreed to install monitoring devices in the homes of residents with odor issues to gather objective data. Resident Megan Hampton expressed her frustration that the monitor she was promised a week ago has yet to be installed. Chief operating officer Stephen Braun, in an interview last week, said the sewer system installed in the 156-space park by Hometown in 2015 is operating as designed and that independent testing shows sulfide gases below OSHA safety thresholds. He could not be reached for comment Wednesday. Hometown owns 55 parks in 10 states and features Laguna Terrace Park, with its ocean views, on its homepage. Residents own their own homes, but must lease their spaces, paying as much as $3,000 a month for view lots. Some building standards differ for mobile home parks. Rather than seek city approval, the Hometown application to replace or upgrade the water, gas, sewer and electrical in the park was reviewed by the state Housing and Community Development Department in August 2014, documents show. Department representative John Contreras signed off the project, a job estimated by Moran Consulting of Torrance at $700,000, without corrections in June 2015. In response to complaints by park residents, South Coast Water District workers went to the park five times last week, said Andrew Brunhart, executive director. The district provides water and sewer service from Nyes Place south to Dana Point. Field staff, which did not initially detect an odor, returned again at 8:30 p.m. and this time picked up an odor and detected hydrogen sulfide gases from a private manhole in the park, Brunhart said. Instruments gave a reading of 4 to 6 parts per million, he said. An alarm would be triggered at 10 ppm. “At that reading it is considered a potential problem, but not harmful,” Brunhart said. McCormick recently contracted pneumonia, which she believes was caused by long-term exposure to the noxious odor rising from her home. District field staff told her she may be able to detect a difference in two or three days. The Occupational Safety and Health Administration website, citing scientific guidelines for industrial hygenists, recommends a threshold exposure to hydrogen sulfide of 1 ppm over eight hours and a short-term exposure limit of 5 ppm. 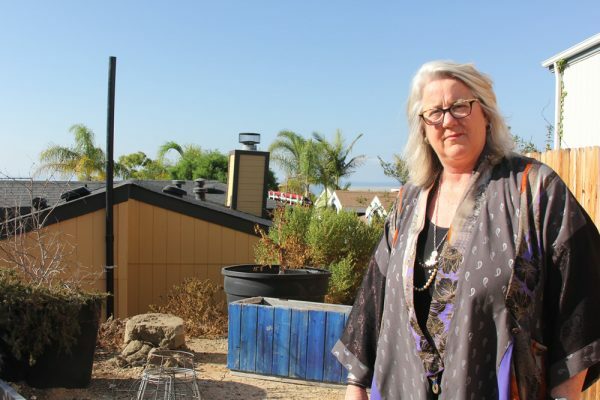 South Coast recently installed similar odor backflow prevention devices on connections to its sewer main on a street near the park, Ocean Vista, Brunhart confirmed. “While there is nothing to suggest that the district’s sewer main is causing any odors, the district is proactively installing three devices,” he said, at each of the sewer main connections within the park.